This now-lost holy well was a place whose history was integrally tied to the adjacent and also destroyed Bishop’s Palace: a large ostentatious building that was already in ruins in 1579, just below Dunblane Cathedral. It was the water supply for the bishops who lived here; although exactly when it received its original dedication, and by whom, seems unknown. Mr Barty informed us that the line of the footpath was still visible in his day, but it has long since gone. When Archie McKerrarcher (1992) wrote about the site, he described minor remains of it still extant, telling that “the Bishop’s Well can be seen marked by circular stonework in the grass”; but this has now also been destroyed. One would think that the local christian community would at least have tried to preserve this ancient site. Barty, Alexander B., The History of Dunblane, Eneas Mackay: Stirling 1944. Dennison, E.P. & Coleman, R., Historic Dunblane: The Archaeological Implications of Development, RCAHMS: Edinburgh 1997. 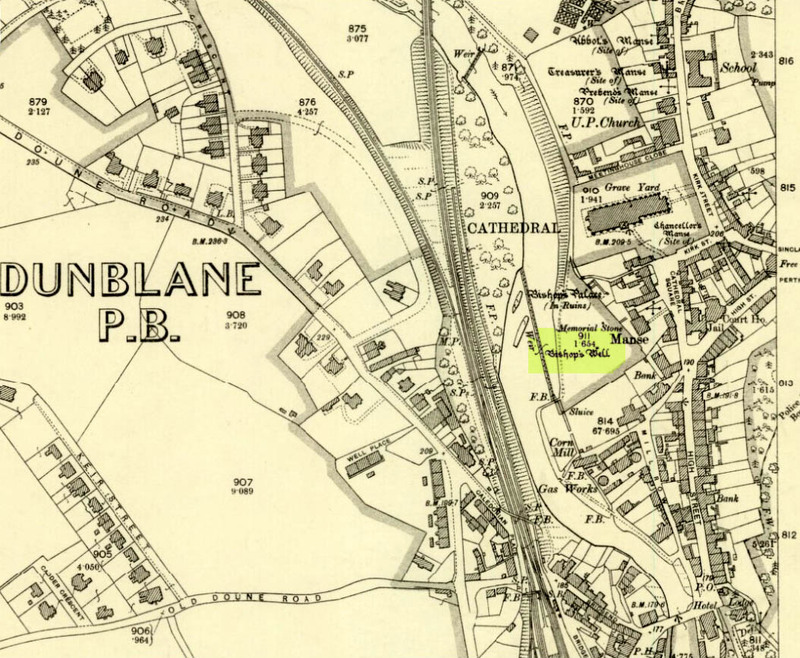 McKerracher, Archie, The Street and Place-Names of Dunblane and District, Stirling District Libraries 1991. Acknowledgements: To Paul Hornby in his help seeking out this site; and to the staff at Dunblane Library. This entry was posted in Holy Wells, Scotland, Stirlingshire and tagged ancient sites, antiquarian, antiquities, Archaeology, bishops, christianity, Dunblane, heritage, Holy Wells, medieval history, Perthshire, River Allan, sacred sites, St Blane, Stirlingshire, water. Bookmark the permalink.